How to Disconnect for Deeper Connection | Backcountry Lodges of B.C. How to Disconnect for Deeper Connection | Backcountry Lodges of B.C. 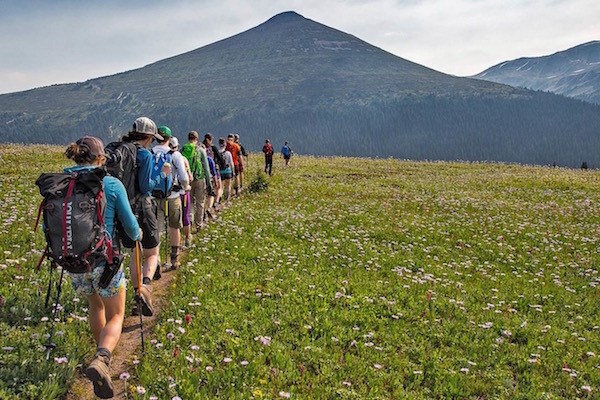 “Disconnect to connect,” Leah Evans says to us, 13 total strangers standing in a circle at a remote trailhead in British Columbia’s Purcell Mountains. We’re about to embark on the inaugural Airplane Mode Camp led by Evans and her dream team of experts: Madeleine Martin-Preney, a hiking/ski guide and the first woman to traverse the formidable Selkirk range on skis, and Katie Burrell, a legend on the comedy scene for her hilarious take on mountain-town living. Airplane Mode is a radical experiment to connect a group of strangers to each other through nature, self-discovery, comedy and complete disconnection from the outside world. None of us know exactly how this will work, and there’s a nervous anticipation in the air as the questions swirl in our heads. Are we supposed to set an intention for the weekend? How does comedy fit in? I’m not very funny … Am I supposed to bare my soul to people I don’t even know? And what’s an “intention,” anyway? But in our craving for a break from the 24/7 connection of our cell phones, we handed ourselves over to Evans without question, and given her background, we felt pretty good about it. A pro skier who’s featured in Jumbo Wild, Pretty Faces, Into the Mind and other films, Evans is known as much for her prowess on snow as for her dynamism. She’s the force behind the iconic Revelstoke-based Girls Do Ski program that’s single-handedly created one of the strongest communities of female skiers that the sport has ever seen. And Airplane Mode isn’t her first experiment in marrying mountains with an unknown element: She produced the upcoming documentary Cabin Jams that brought music creation into backcountry skiing. Airplane Mode introduces human therapy and comedy into the natural equation. And because we didn’t know what to expect, none of us expected what actually happened. As we hiked the 7½ miles to Purcell Mountain Lodge, we skipped straight over the small talk. With our phones tucked discreetly in our packs, we got to know each other on the kind of deep level that’s unique to the backcountry, where time slows and an hour feels like a day.